Acupressure is ideal for use with animals because it is gentle and noninvasive. It doesn’t cause stress, discomfort or pain, and yet yields powerful results. 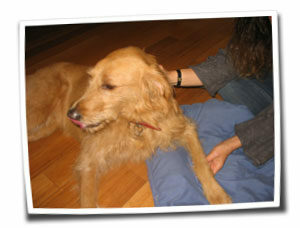 Animals respond intuitively to Acupressure’s power to heal emotional, behavioral and physical illnesses and injuries. Acupressure supports animals suffering from acute conditions or who are rehabilitating from surgery or injury. Our senior friends are excellent candidates for maintenance sessions as acupressure has proven to be extremely beneficial for arthritis, metabolic conditions and other health problems that tend to trouble older animals. Animal athletes (i.e. agility, dock dogs, surf dogs and search & rescue animals) are also ideal recipients of acupressure to enhance strength while maintaining flexibility. For animals who have a non-emergency acute condition or a chronic issue Acupressure is a wonderful healing method as well as a safe complement to Western Medicine, homeopathy, flower essences and all other forms of healing. For animals with behavioral issues especially fear-based aggression or anxiety Acupressure is a powerful tool to help them relax and stop the cycle of panic or anxiety. Acupressure can work well with training sessions and behavior modifications to help speed up the desired results. For animals in transition Acupressure, combined with Reiki, is a powerful, yet gentle way to provide comfort, relief from pain, fear and anxiety; and to ease the transition. Acupressure is ideal for use with horses because it is gentle and noninvasive. It doesn’t cause stress, discomfort or pain, and yet yields powerful results. Horses respond intuitively to Acupressure’s power to heal emotional, behavioral and physical illnesses and injuries. Acupressure supports horses suffering from acute conditions or who are rehabilitating from surgery or injury. Our senior friends are excellent candidates for maintenance sessions as acupressure has proven to be extremely beneficial for arthritis, metabolic conditions and other health problems that tend to trouble older horses. Equine athletes (i.e. Hunter Jumper, Dressage, Western Pleasure and Racehorses) are also ideal recipients of acupressure to enhance strength while maintaining flexibility. For horses who have a non-emergency acute condition or a chronic issue Acupressure is a wonderful healing method as well as a safe complement to Western Medicine, homeopathy, chiropractic, massage and all other forms of wellness care. For horses with behavioral issues especially fear-based aggression, or anxiety, spooking , cribbing, etc Acupressure is a powerful tool to help them relax and stop the cycle of panic or anxiety. For horses in transition Acupressure, combined with Reiki, is a powerful, yet gentle way to provide comfort, relief from pain, fear and anxiety; and to ease the transition. Who is using acupressure on animals? People have been using acupressure to care for animals for at least 4,000 years. Over 230 generations have consistently recognized the benefits of this ancient healing art. According to the IVAS [International Veterinary Acupuncture Society] there are over 1,000 vets that practice acupressure or acupuncture in the United States alone. Check here for a list of vets in your area. There are also hundreds of qualified animal acupressure practitioners in the US and abroad. Check out NBCAAM or Tallgrass Animal Acupressure Institute for more information. Acupressure is practiced all over the world on people and animals. 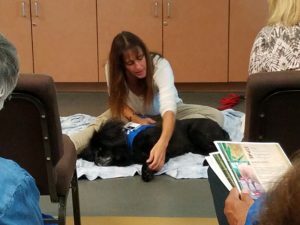 Vet clinics, rehab facilities and healing centers are all using acupressure on animals to help facilitate the healing process or to maintain heath and balance. While Acupressure is a powerful healing system on its own, it is also a wonderful complement to other therapies that may be helping the animal recover. It is not meant as a substitute for veterinary care. Always consult your veterinarian about the best course of medical treatment for your animal.